Manny Pacquiao's eagerly-awaited fight against Floyd Mayweather is "not his most dangerous", according to his advisor Michael Koncz. The veteran boxing legends are finally set to meet on Saturday at the MGM Grand in Las Vegas for a contest believed to be worth £150m. Mayweather has never been beaten in 47 fights since turning pro in 1996; Pacquiao has lost five of his 64 bouts. "It's a very difficult fight, but not the most dangerous fight," said Koncz. The advisor also added the American opponent had been "cherry-picking" recent bouts. "When it comes to the boxing ring we respect Mayweather greatly," he told BBC World. "He's one of the great defensive fighters, but he hasn't fought anybody with the speed of Manny. "I don't care how good the defence is, if it's throwing 10 punches and stopping nine-and-a-half. "But throwing 80 punches means nobody can have a 90% ratio of stopping them." Koncz said Pacquiao would have to set the tempo early on in order to gain a foothold in the contest. 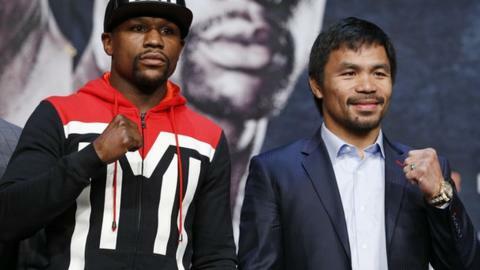 "Floyd is a slow starter and we've got to set the pace and make it Manny's style of fight," he added. "If we don't do that by the fourth/fifth round then Floyd will get into his rhythm and comfort zone."